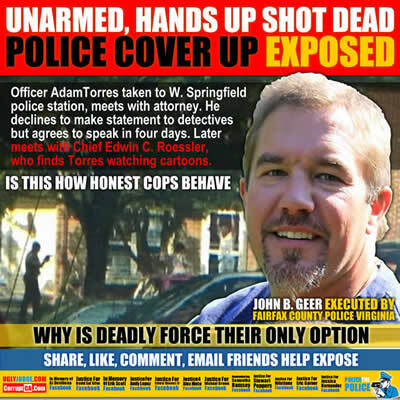 John B. Geer unarmed was executed by Fairfax County Virginia Police Officer Adam Torres. 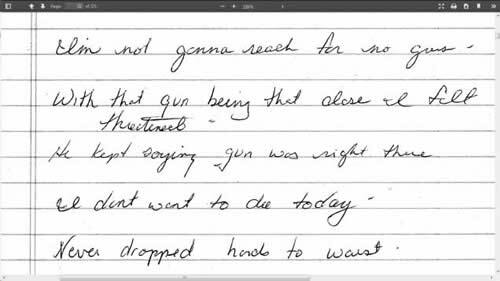 Not only has a huge cover up been exposed but information coming out exposes the “nut case” cops we hire and give deadly force to. Not only did this dishonest Police officer lawyer up right away he was not truthful and did not cooperate. Fairfax County prosecutor Raymond F. Morrogh said police repeatedly refused to provide internal affairs records of the Fairfax police officer who shot and killed a Springfield John B. Geer in 2013, and county officials vowed to put up a fight should he try to seek them through court action. The crime being the excuse “We’re investigating ourselves” as a way to delay and allow people to forget. Thank god someone video taped the event as otherwise government and police as they’ve done in the past will lie, cheat and manipulate the facts to avoid law suits and accountability. Think about it, if non-government approved people did what they did they’d be labeled a criminal. It’s called rationalizing murder and “legal killing”. The only difference they use a lawyer in a black robe called a judge who deems it “Acceptable”. Funny how when its law, killing is ok but when you do it to them its “against the law”. This is equality in America today. Crime should depend on the act, however in America it depends on who is doing it. Government can kill people and they do, its called war. Police can kill pets, women and children, they get away with it because they’re on the side of law and held ABOVE THE LAW.